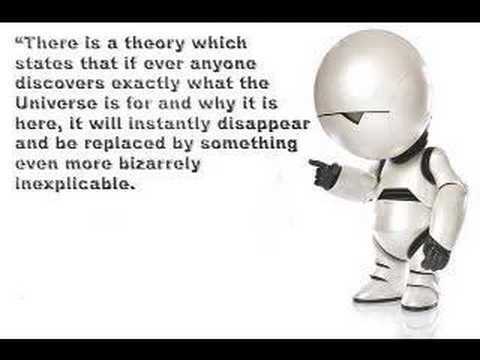 This pic taken from net is a quote from the book : The Hitchhikers guide to galaxy, also a movie. This is sort of a humorous novel about the universe, good to read in your leisure time. Stephen Hawking says that he gets so many mails every week from people telling their theory about the universe, this is the way it works. In physics world a theory is just a proposition, putting forward an idea for explaining something. The theory goes through experimental phase. When a observation or finding can be reproduced with consistent results in lab on the basis of give theory, a theory is proved & remains correct until someone disproves it experimentally. That thing which cannot be proven in lab or observed in case of astronomy in not a scientific theory but a hokum. In astronomy as there is no lab experimental results, there are mechanisms like observations which confirm the predictions of a certain theory. There are two widely accepted theories of the universe in the entire history of physics, the big bang theory & the steady state theory, It was not long back I was discussing with Naveen, Vice president of BAS - Bangalore Astronomical Society about the survival of steady stare theory which is kind of popular only second to the widely accepted Big bang theory. Big bang theory states universe was created in a gigantic very massive explosion called the big bang, all the matter, energy & the time was created at that moment. That very moment is so bizarre & difficult to explain that it is considered as a singularity, A singularity in physics is something which cannot be explained by the known laws of physics, or may be we need a different set of laws to explain the same. On the other hand steady state theory states the opposite, there is no beginning of space & time, universe has always been & will continue to be for ever. there is no specific point in history where the universe began. Matter & energy are created continuously in the fabric of space-time. There was this article link which was sent in BAS mailing list by someone which provides a evidence for proving the correctness & hence survival of steady state theory. It’s the nature of human mind & consciousness to seek for answers, to explore the mysteries of universe. The changing perceptions in the mind are also part of the ever changing universe, the mystery of which we are trying to understand, hence the changing understandings of the universe also implies a changing universe with respect to time. but the mystery of universe rocks forever.